On March 19, 2019, MBC conducted its first workshop at the Terra Linda Community Center (TLCC). There were four members involved in pruning, thinning and wiring, while one member repotted an azalea. It is time to move on to seasonal tasks so the club won’t be bringing soil and drain hole screen material for repotting to any more workshops this year. Visit the Taskmaster page on this website for information on seasonal tasks. This Chinese Wisteria was air-layered by Bill Sullivan, my first mentor, back in the 1980’s. I acquired the tree as partial payment for the cosmetic remodel of his kitchen – that was back in 2000 or 2001. This tree was featured in the new edition of Sunset Magazine’s ‘Bonsai: Illustrated Guide to an Ancient Art’, 1994. I also acquired two other trees that were featured in the magazine. Bill was considered the grandfather of Marin County bonsai, and was instrumental in starting our show at the county fair. He was the show chairman since Marin Bonsai Club showed their art at the fair, a job which I took over after Bill passed me the reins. This Wisteria’s truly been a joy to own and show, not one year has it not bloomed profusely like you see in the picture. Not only does it flower well, the fall color and the winter silhouette makes it exciting to own. A true all-season viewer. 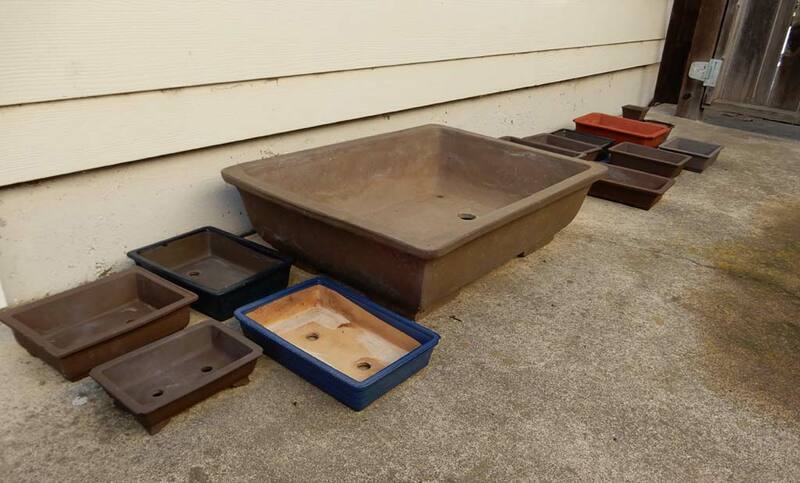 UPDATE: The sale of Honda bonsai pots is complete. Out of 54 bonsai pots, 52 were sold and one was sold through auction. One chipped pot was disposed of. 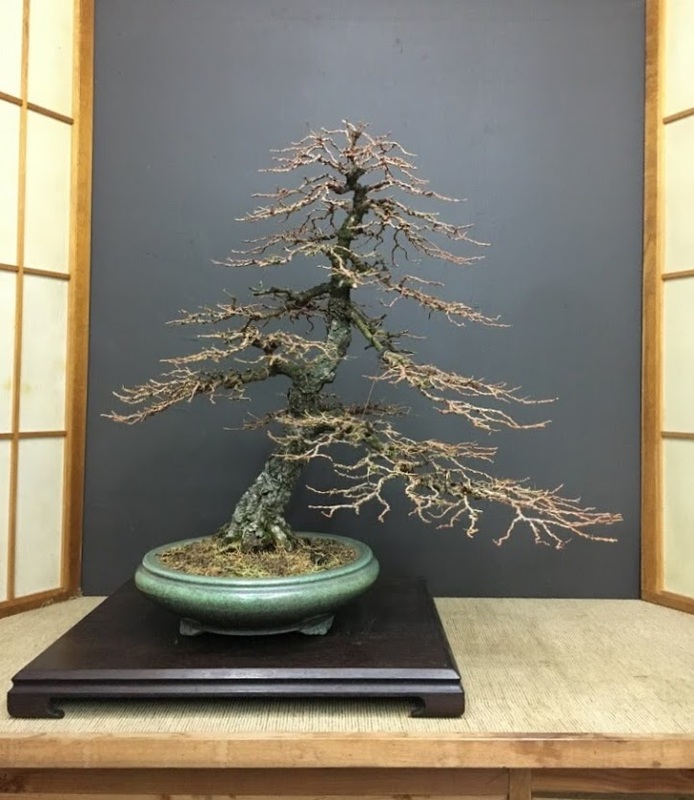 The members of Marin Bonsai Club purchased 44 in total. The 10 other bonsai pots went to the Bonsai Garden at Lake Merritt Mammoth Auction and Sale. It took nearly four months to dispose of the bonsai pots; including transporting, washing, announcing the sale, conducting the sale. 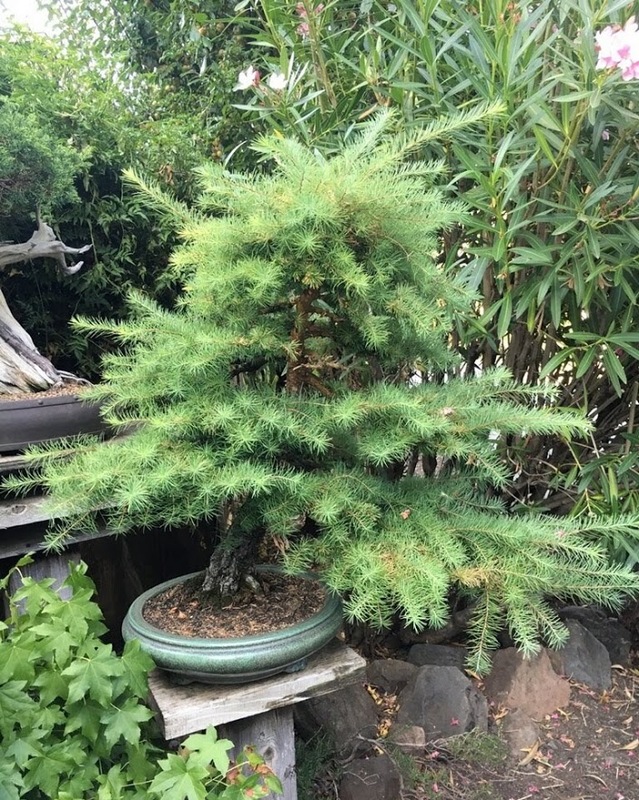 Marin Bonsai Club received a percentage of the sales. All proceeds went to the Honda family. MBC members have already taken advantage of purchasing Honda bonsai pots. These bonsai pots are being sold on a 80/20 split for the benefit of the Honda estate and MBC. 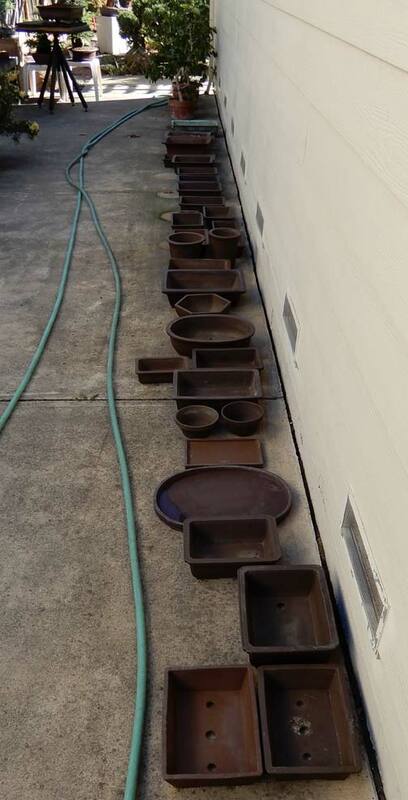 Some 19 out of 54 bonsai pots have been purchased to date. There are quality bonsai pots remaining to be sold. Contact George Haas at gwhaas@comcast.net or 707-762-9154 if interested. As a reminder, repotting season is from December through March. MBC has scheduled three consecutive repotting workshops in January and February of 2019. All it takes is a lot of time and a whole bunch of skill. Here’s a ‘before’ shot of Jay McDonald’s fluffy Japanese Larch, a deciduous conifer. Jay spent 7 hours plucking needles prior to his recent all-day wiring marathon/workshop with visiting bonsai professional Bjorn Bjorholm (http://www.bjornbjorholm.com/). In this case, ‘all-day’ = 10 hours of wiring! Fortunately, Jay estimates he won’t need to unwire this tree for two years. Almost tragically, this tree lost two important branches about 3 years ago. Jay unwired the tree then and grew new branches to fill the vacancy left behind. Jay’s effort has really paid off!